The first concert 1988 From 1975 to 1978 I worked in the Technical University of Berlin's electronic studio directed by Folkmar Hein. 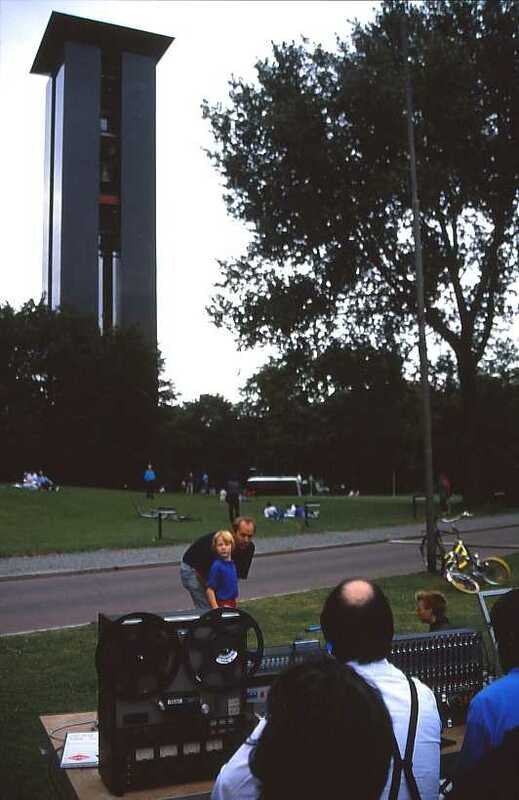 After the Carillon in Berlin-Tiergarten was built in 1987 Hein and I staged a concert with music for carillon and electronics as part of the Werkstatt Elektroakustischer Musik conducted while Berlin was the cultural capitol of Europe in 1988. The large instrument with 68 bells offers a broad spectrum of sonorities. It is also relatively close to the the loudspeakers on the ground where the bells mix well with the electronics. Warm, dry weather during the rehearsals and performances is also necessary to keep the electronic apparatus from being damaged by rain and moisture (a concert planned in 1998 had to be cancelled due to bad weather). A number of solcher concerts for carillon and electronics were staged thanks to the support and cooperation of von Folkmar Hein, and those which took place in 1995, 2001, 2003, 2005, 2007 and 2011 were made possible with grants from the Initiative Neue Musik Berlin e. V. A number of compositions for these concerts were commissioned, the most important being Ricardo Mandolini's Vox veterrima. Folkmar Hein was born in 1944 and directed the Electronic Studio of the Technical University of Berlin from 1974 til 2009. In the course of his teaching activities, researches and the many concerts he staged more than 480 works were created at the studio by guest composers from home and abroad. In 1982 he founded the festival „Inventionen“ in cooperation with Ingrid Beirer and the DAAD Berlin artists program and produced groundbreaking programs during next eighteen years. In 1985 he started the weekly series called „Listening to Electroacoustic Music“ which is still running today at the Electronic Studio of the Technical University of Berlin. Folkmar Hein filled the studio's sound archives with more than 10,000 works by composers from all over the world. He was the president of the Deutschen Gesellschaft für Elektroakustische Musik (DEGEM) from 1991 to 1997. In 2010 he was awarded the honorary prize of the Deutscher Klangkunstpreis. Works by John Cage, László Dubrovay, Richard Felciano, Roy Hamlin Johnson and Ricardo Mandolini*. Works by Friedemann Graef and Ricardo Mandolini*. Works by John Cage* and Erik Satie. Works by John Cage*, Aldo Clementi, Lutz Glandien, Ricardo Mandolini*, Per Nørgård and Anthony Skilbeck. Works by John Cage*, Ricardo Mandolini* and Ed Osborn*. Works by Ricardo Mandolini*, Lucia Ronchetti* and Mario Verandi*. Works by Ricardo Mandolini*, Franz Martin Olbrisch and Mario Verandi**. Works by Jeffrey Bossin**, Ricardo Mandolini*, Ed Osborn* and Mario Verandi*. July 10, 2011 Works by Hans Koch* and Douglas Repetto.